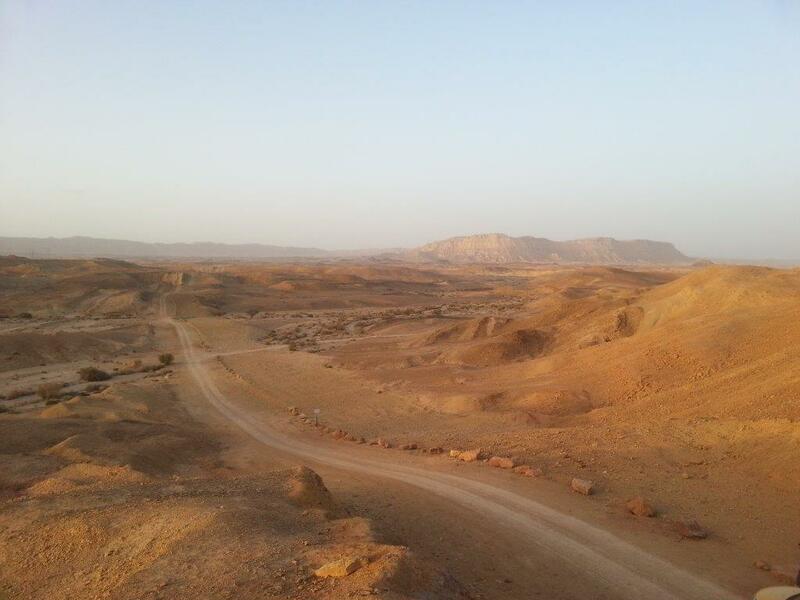 We started with a breakfast in the north of the desert, a small restaurant and goat farm, Kornmehl’s goatfarm (it’s in the middle of nowhere! ), with a variety of very tasty goat cheeses, that you can also buy there to take home. We had goat cheese for breakfast, surprise! Cheese, with some bread, and lemonade. Simple, tasty, and sitting outside on huge pillows, with a view…amazing. 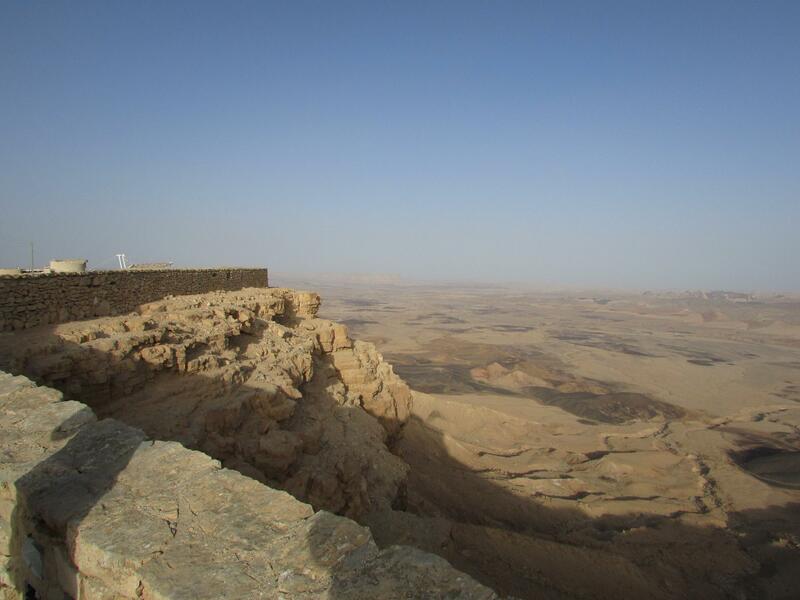 After that we drove further southwards, to Ein Avdat, a national park, which is very popular, both with Israelis and tourists. Still, since it is big, it wasn’t very crowded. 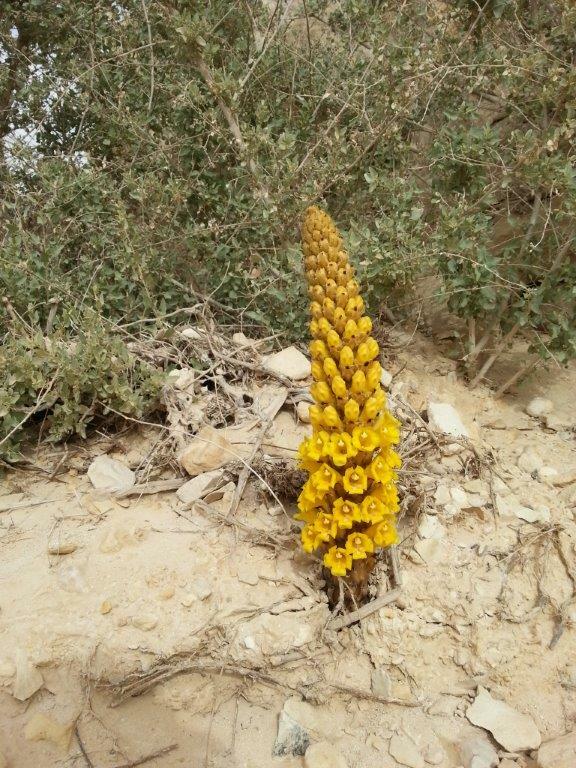 Its huge canyon, with white walls (well other colours as well, but the white impressed me most), and very interesting plants (weird flowers, see below). We ended in Mitze Rapon, near the Rapon crater, a very very impressive huge crater, with a beautiful view, after that we drove into the crater (well, I think we were more or less in the crater.). It was just plain beautiful. the colours! Oh and cold as well, windy, and apart from the wind, complete silence. We thought we deserved a good meal after walking and driving around the whole day. 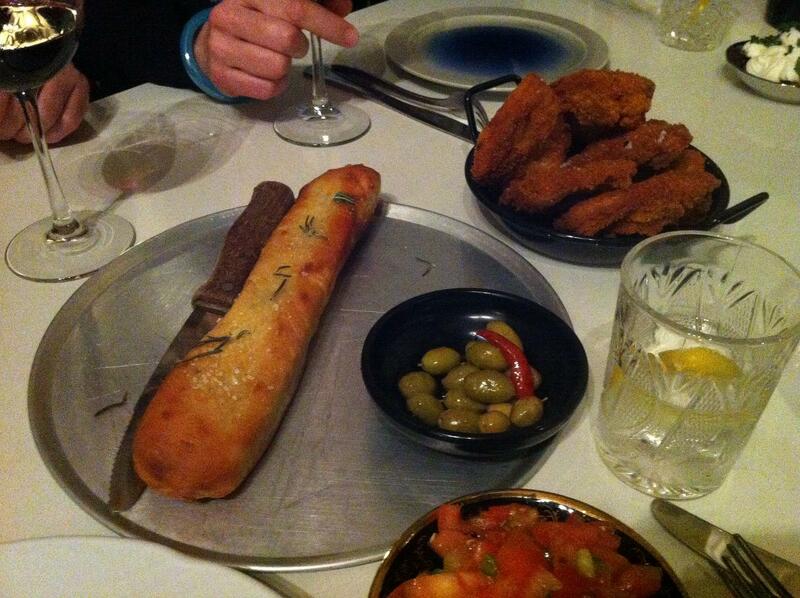 Which was not too easy, because, once back in Tel Aviv, it turned out everyone thought they’d deserved a good dinner. It was crowded in many places. But luckily, we were almost locals by then, so I suggested Noah’s bistro, where my girl and I had just had dinner a couple of days before. Noah’s is always a good idea, although the quality of the service depends a little bit on who is serving (we missed Amy Whinehouse this time). Anyway, we started with a mixture of vegetarian starters (Lebaneh, fried eggplant, sweet potatoes, good bread), and these were fresh, tasty, delicious as ever. We ended with different main courses, and I had Shakshuka. This one was very different from the one I had made with Ottlolenghi’s recipe. Much less sweet, much more spicy, more cumin. Mine was vegetarian, but the restaurant also offered a version with shrimps and one with sausages (that should be interesting too!) It was, again and of course, very tasty, but also a little exhausting to eat. Since it was so spicy and the taste was so strong, I could eat only a little, and hence the dish would have been more than enough for two persons (luckily I got help from my friends). I think I shouldn’t have eaten the starters may be. 8 more meals to go! 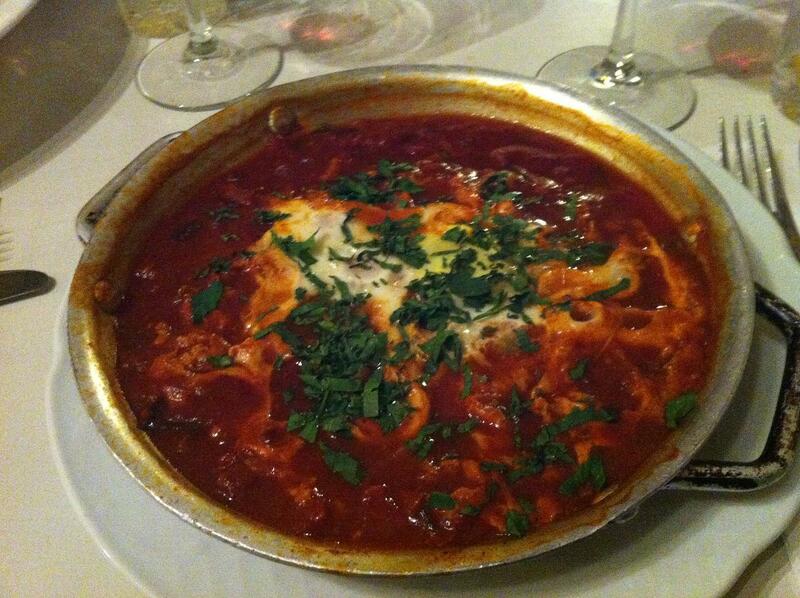 This entry was posted in ate, estherdoesotherthingstoo and tagged goat cheese, Israel, Kornmehl, Negev, noah's bistro, shakshuka on June 26, 2013 by esthercooks. I had Dutch sparkling wine last saturday. Dutch! Wine! From the Netherlands! You know, this little country where it rains all the time (well often), and that’s not famous for it’s summers? Riesling, sparkling wine. And we got it here: http://www.restaurantdekas.nl/ as an aperitivo. I can recommend both the restaurant and the wine. The wine was very fresh, dry, and had a very clean taste. Not too fruity, not too sweet. And not too bubbly (I don’t like too strong bubbles). Nothing to be ashamed of, Dutch wine. And if time allows, more on the restaurant later. This entry was posted in drank and tagged de kas, limburg, riesling, wine on June 5, 2013 by esthercooks.